I know only that cygwin eat 5 GB of space and is useless, I'm very angry 'cause I tried to install and reinstall it 5-6 times and every time requires about 30 minutes. If is the only way to get further I close the project, sorry, thanks for the help but this thing have something wrong, maybe in their servers, I know only that don't work and find strange errors never seen in my life. Remove Cywgin entirely. Reinstall and install only the packages the repository tells you to install in the instructions. You're doing a lot of things that aren't listed in INSTALL.md, and not doing many things that it does tell you to do. Follow the instructions. You're getting that error because you installed packages that depend on libusb, which you don't need. 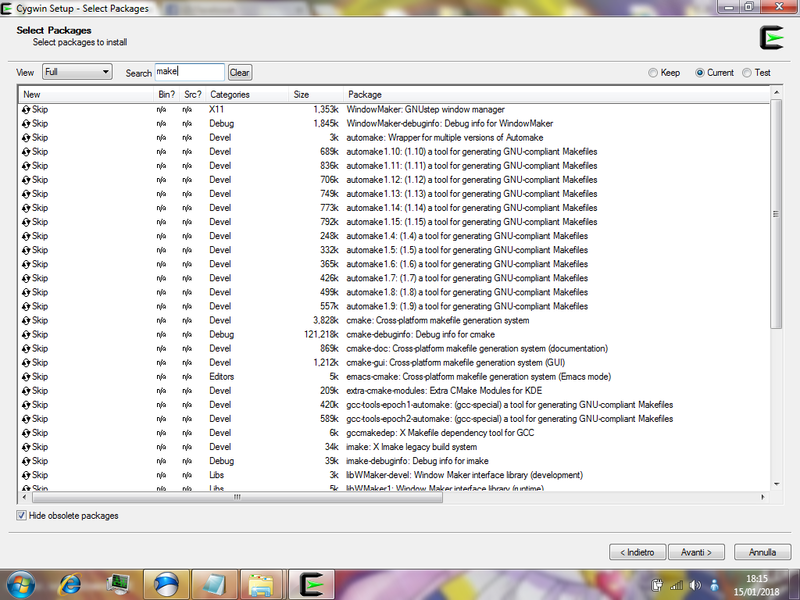 When I search the 3 words the installer find a lot of stuff and I selected all. How I can know how I have to select and not? You don't install everything. You install the three packages it tells you to install. Only three. How can you know which ones you have to select? Look down the list and find the ones with the right name. They are in alphabetical order. Reinstalled it only selecting the only files. But return to the first bug, segmentation fault at the end.1bpp file. Like required in the hacked repository install.md but don't work, is always the same bug. Seems however that couldn't convert PNG to .1bpp files. But I don't know how fix it. Maybe there's some weird incompatibility with your system or with 32-bits, it's hard to say what causes it. I'm also not sure where you're seeing python and gettext from, but having them installed shouldn't really impact things anyway. Says about Python and gettext, but is the same thing, with or without say the same error. Then there isn't nothing to do? Hard to say. The compiling works fine for other people, and seg fault is a really non-specific error that is difficult to really debug. Is there anyone else running 32 bits Windows and who got it to work fine on Cygwin x86? 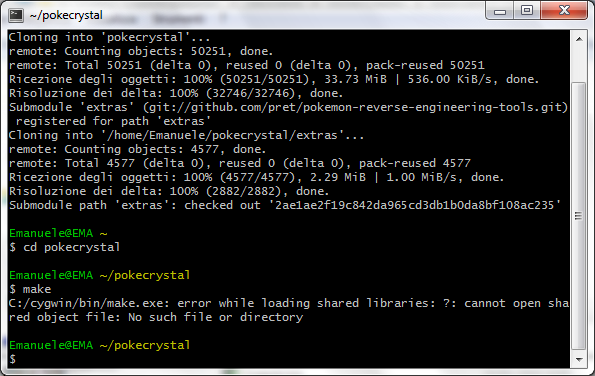 It's actually a lot more complicated than just copying the changes from that commit onto a vanilla copy of pokecrystal, because Rangi's hack already had Pewter Museum implemented and everything, among others, which would also need to be implemented before it can be fully done. I (or someone else) would have to look back a bit more through polished crystal's commit history to see how everything has been implemented, which is definitely doable, but would take a bit more work. Mhh... I found a guide that say how modify the repository to add the classes, I'm hacking the needed files, I could pass you them to do it? I have only a doubt, in Rangi repository he added in pics.asm the string "TODO" that could mean "to do", then add the pics, or I can simply overwrite backpic Unown R and I (that are duplicated) and TODO isn't necessary? P.S. The files downloaded from Github have annotations like "Accidentally copy" or "The trainers palette" that Rangi repository files don't have. Are safe or I have to delete them? Can't really tell you about that last part, but if you make a fork of the repository and host your modified files there on github, then other people could download it and try to compile. I have to upload all or only the hacked files? In Gold 2 files are missing by Crystal, are pics.asm (but maybe isn't necessary) and scripting.asm, I tired searching similar strings on the main folder, but found string in different files, maybe in Gold the scripts were different. However we could try with Crystal before continue to search the missing file in Gold?